Probably the easiest alternative to punch and bind machines is a book ring! 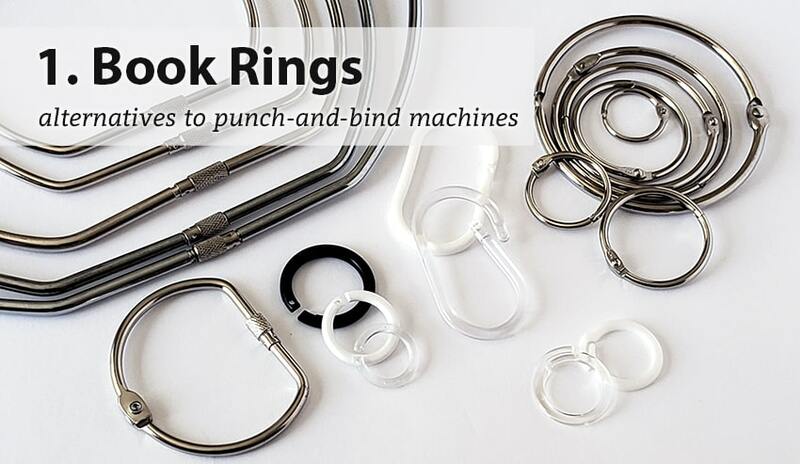 Also called loose leaf binding rings, they come in several sizes and styles including standard metal looseleaf rings (most popular), screw lock metal rings, plastic snap rings, oval plastic snap rings, and plastic overlap rings. They are secure once closed so your pages won't fall out, but are also easy to re-open as many times as you need for quick editing. Super easy, inexpensive, and all you need is a hole puncher; that's why book rings are the most popular way to bind books without a machine. Book Binding Rings - Choose from several styles. Hole Punch - You can use a single hole punch, a 2-hole, 3-hole, or any other punch you want. Punch your pages with as many holes as you want. Open the ring, place it through the hole, and close it. Repeat for as many rings as you are using. 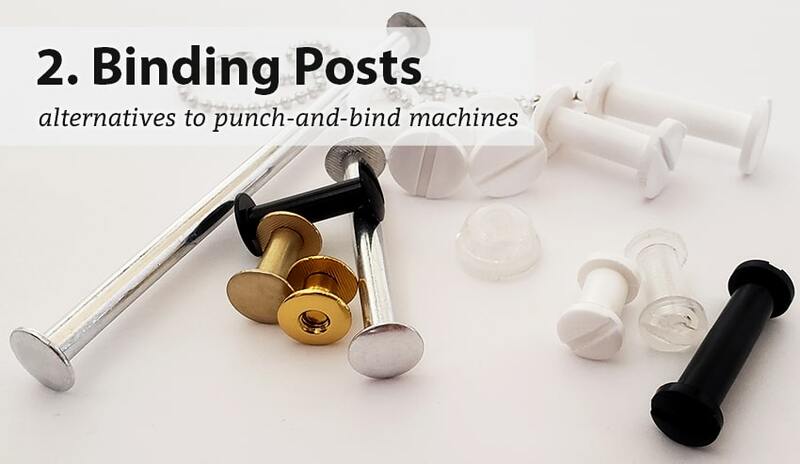 Book binding posts, often called Chicago Screws or screw posts, are another great alternative. Just like the rings, all you need is a hole puncher (any kind and any configuration of holes). Binding posts come in a huge variety of lengths, even up to 5" thick. They also come in metal and plastic options. The metal options have extension screws that can also expand the capacity further. Metal book posts are easy to unscrew and edit whenever needed, while plastic ones offer a more permanent/secured bind. Screw Posts - Choose from several styles. Pliers (Optional; recommended for plastic) - If you're using plastic snap-lock posts, a set of needle-nose pliers is sometimes helpful to both close and re-open, if necessary. A towel is also helpful for grip. Place the post through the holes, then twist-in the screws. Or if using snap-posts, press in the screws. You can use a pair of pliers if it is too difficult in this case. Making notepads is another great alternative to punch-and-bind machines. These tear-away pads are fun and simple to make, but they do take a bit of time because of the drying time required by the glue. Also called padding compound, the glue is a unique formulation specifically designed for tear-away notepads. 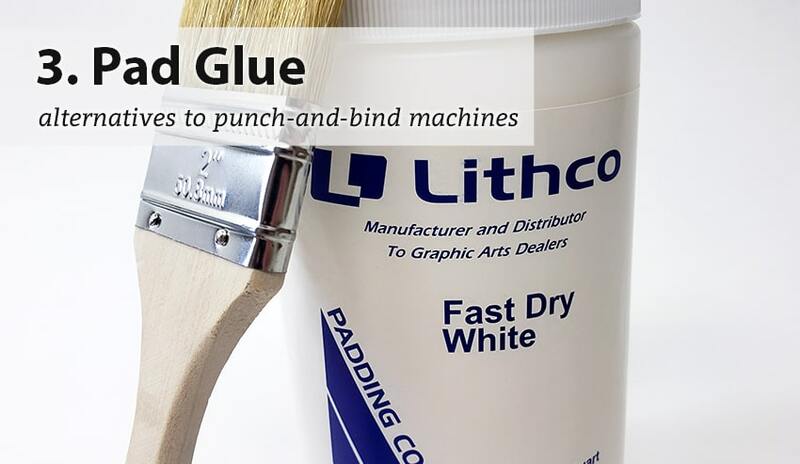 Pad Glue - Available in several styles (fast dry, extra fast, and fan-a-part for multi-part form paper). Also available in quart or gallon sizes. Pad Brush - Any kind of brush to apply the glue to your stack. Clamp - You can use a padding press, some table clamps, or even binder clips for small pads; anything to hold the pages tightly together. Chipboard (Optional) - If you want a more sturdy backing, use a chip board sheet. Pad Knife (Optional) - This is helpful and only needed if you are padding multiple pads at the same time; it will easily cut through the glue to separate the pads once dry. Pad Counter (Optional) - This is a helpful tool for bulk padding as it helps you get the same quantity of pages to prep for padding. TIP: Make it a magnetic notepad by adding a self-stick magnet strip. Clamp your pages together at the binding edge with your chipboard at the bottom. Brush the glue onto the binding edge and allow to dry. If needed, add a second coat and allow to dry. If applicable, separate the pads below each chip board sheet using the pad knife. Or if you were hoping for something that is closer to the traditional spine-bound look, then why not try spiral binding coils? While a machine is very helpful and will allow for more customization, you can pair together a few different tools and supplies to easily bind coil books without a machine. 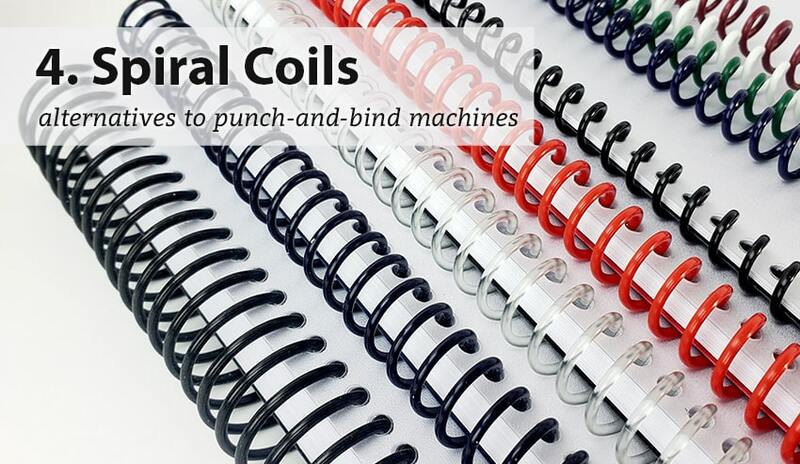 Spiral Coil Binding Spines - Choose from a huge rainbow of colors and sizes. Pre-Punched Paper - There are a couple different variations of punched pages you can use. These plain white sheets can easily be printed with whatever you need from your standard printer. Oval and round holes will both work, and the 43 vs. 44 hole just have a slightly different margin on the edge. Pre-Punched Covers (Optional) - If you want a presentation cover for the front and/or back, you can also find punched cover stock. Just choose the same punch pattern as your paper sheets to ensure they match. You can choose coil punched clear covers and/or coil punched vinyl covers. Crimping Pliers - This handy tool works just like a set of pliers and will trim your coil down, and fold in the edge so it won't roll out. Print your pre-punched paper and place the sheets in order with your pre-punched covers. Roll the coils in through the holes. If doing a thicker book, it is easier if you shape the spine of your pages to match the coil shape. Use the crimping pliers to cut/crimp in each end of the coil.